The land of Justin Trudeau is in a poor state. The societal reforms and mass immigration imposed by our Leader are not supported by the population, but the resistance is passive if not totally apathetic, with the notable exception of Quebec where the identitarians, nationalists, and other dissidents make the headlines every week. In English Canada, by contrast, there seems to be just a single man standing against the madness of the multiculturalists be they cuckservatives, liberals, or cultural Marxists: he is Ricardo Duchesne. 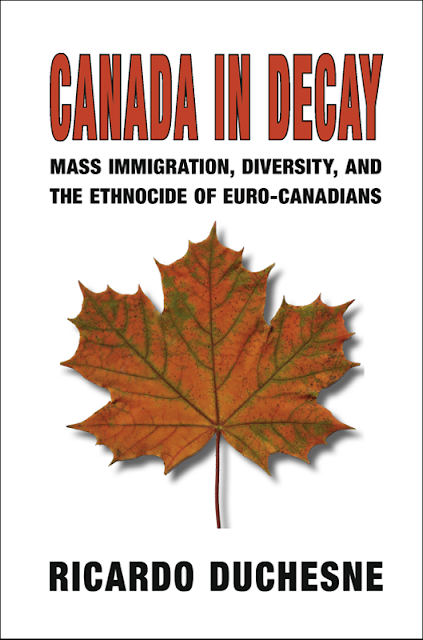 After publishing Faustian Man In A Multicultural World earlier this year (my review), Duchesne is now publishing a book devoted to Canada and Canadian matters. This is an early Christmas gift, something we Canucks are definitely not used to. For years we have been reading books written by Americans or Europeans and now, for a change, we have a book about our country written by one of us. Canadians should buy the book regardless of its content for this very reason, eh? And the rest of humanity should also acquire and read this book, because it has universal appeal in the sense that Duchesne attacks the multiculturalist ideology, taking aim at Charles Taylor and other advocates of "minority rights," not only historically, but also philosophically. But, let's think about Canada for once. It is impossible to count how many times we may have heard that Canada is a land of immigrants and that it was founded by immigrants. This lie, repeated ad nauseam in our academia and media, creates the impression that the current patterns of immigration — especially mass immigration from the Third World — are not something new, but something natural that has always been. Worse, it gives the false impression that we, the descendants of the first settlers, have no more or even less importance historically speaking then the Haitians currently living at the Olympic Stadium. As anyone who has studied history knows, this conception of a land of immigrants is utterly false. If we take the French Canadian example, the European population settled on the shores of the Saint-Lawrence and grew because of its own demographic vigour. French immigration ceased in 1760, but we now count millions of French Canadians who originate from the few thousands who dared cross the ocean before the British Conquest. We cannot talk of a nation of immigrants: the population is homogeneous and homegrown. And semantically, it would be obscene or ignorant to use the word immigrant as a one-way synonym for settler. The situation is quite similar for the Anglo-Canadians. After the Conquest, most of the population, the Loyalists, came from the United States. It was an internal migration from one British colony to another. In the first century after the Conquest it was clear that Canada, except French Canada (now mostly Quebec and Acadia) was a British nation with a British people expressing British traditions. Yes, there have been immigration waves, but they were almost exclusively from Europe. In 1970, when the immigration gates were open to everyone around the world, the population of Canada was 97% European. The rest included the Amerindians and the few non-White immigrants. This historical revisionism is so widespread that Duchesne only sees one historical parallel to draw: with the USSR. And the contradiction in the mainstream discourse is so flagrant, no one sane with a functioning IQ can believe it. On one end, our mainstream historians present Canada as an inclusive multicultural mosaic since its very inception, but on the other one they try to make us feel guilty by presenting a country that professed white supremacy since the beginning of the settlement. This is what George Orwell termed "doublethink." Must our current elite be reminded that 1984 was not intended as a utopian blueprint to emulate but as a nightmare to avoid at all costs? Another parallel that can be drawn with the USSR is the use of psychiatric terms for anything dissident, like Mathieu Bock-Côté explained in his most recent essay Fin de régime. Anyone opposed to multiculturalism is presented as mentally ill and ethnocentrism is described as the ultimate psychiatric problem. 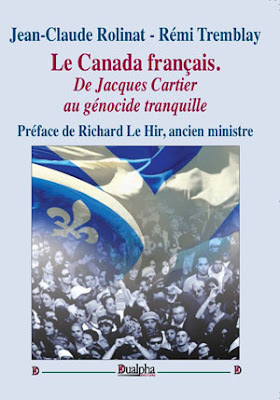 But as Duchesne highlights, ethnocentrism was the social norm until very recently, both among the people and politicians like Mackenzie King, Richard Bennet, and Henri Bourassa. Everyone shared a common view of Canada being a White country and the majority, until very recently, wished Canada to remain so. Even after the adoption of multiculturalism as a state religion, the people held to this view and that despite the brainwashing orchestrated by the schools and media. In fact, since the end of WWII, Canada has been in a spiral of radicalization like many Western nations. The spiral started with the removal of the restrictions against immigration from outside Europe in order to comply with the UN and its charter. Not long after, Canada reached peak stupidity by imposing multiculturalism as the state ideology. Trudeau senior thought that doing so would first dampen Quebec's demands as it would become "one culture among others" and would lose its privileged status gained with the Confederation bicultural pact. He also thought that multiculturalism and the celebration of the different cultures would undermine the hegemony of the dominant British culture. The spiral could have ended there as the Conservatives took power not long after, but the cuckservatives of the Brian Mulroney government actually went further and pushed mass immigration to new heights and supported the Employment Equality Act, which basically is Affirmative Action. Under this law, an immigrant who just landed from abroad is privileged over a Canadian whose ancestors built the land. Trudeau the second, Justin, managed to go even further, which is quite surprising. He presented Canada as the "first post-national country" and one "without any core identity." And he decided to put these concepts into action by increasing immigration even more and by announcing that illegals would be welcomed with open arms. Needless to say that thousands heard his offer and the only reason why more people have not crossed to Canada is that the Atlantic is wider than the Mediterranean Sea. Today, the multiculturalist camp we are fighting is not a monolithic block like many think. From Kymlicka to Jean-François Lisée and from Charles Taylor to Kellie Leitch, there are different, sometimes conflicting, visions of the ways we must handle diversity. For some the immigrant population should be assimilated not to the European culture but to a certain set of so-called universal liberal values. Everyone would be asked to join a mass whose cohesion would be based on the adherence to "Canadian values" like gender equality, LGBT rights, and multiculturalism... That is what the Parti Québécois advocates. In the middle there are those who believe that immigrants do not have to integrate to a greater culture as long as they profess their support to the liberal state and its principles. This is the position of the Liberal Party of Quebec led by Philippe Couillard. More extreme, there are those like Quebec Solidaire or Trudeau's Liberal Party who think that crossing the border is a God-given right and that newcomers owe us nothing and can reject our "values," traditions, and culture, and keep their own even if they are incompatible with our societies. Overall, all these beliefs are based on the same assumption: minorities have the right to an ethnic identity that must be respected. Minorities have both collective and individual rights, but people from the European majority only have individual rights, the very existence of a collective identity being denied as "racist." Thus a Euro-Canadian is an individual, but a Sino-Canadian is an individual part of a collectivity that has interests and rights to defend. All these visions must be rejected. Both the right and the left adopt these cultural Marxist ideals, denying European peoples the very right to exist as such. The nationalists, especially in Quebec, have also surrendered to the dominant ideology by professing a civic nationalism that is a politically correct empty shell. Ricardo Duchesne, who proves to be an original thinker and not simply a copycat, goes as far as to claim that it is under the current mosaic-multiculturalism that Euro-Canadians have a chance to further their interests, and not under an assimilationist system. We can agree or not, but one thing is sure, when he states that mass immigration is the most important topic nowadays, we cannot disagree in any way.